5" Tall x 30" long ramps let you lift your vehicle for service or display. Designed for small sports cars. Ramp incline creates a 16 degree angle of approach. Fit tires up to 8" wide. 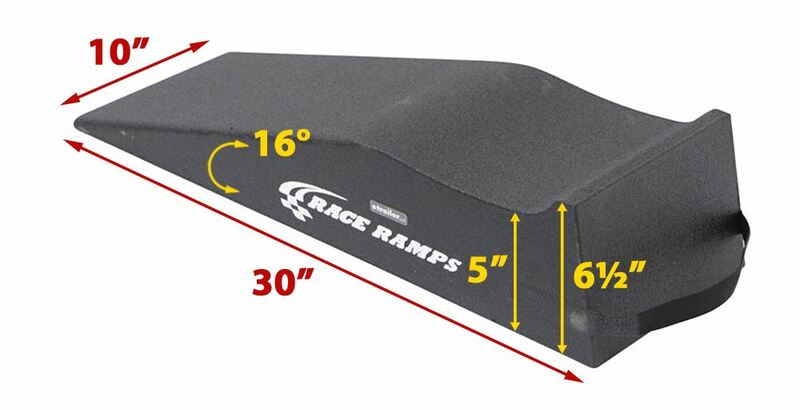 Call 800-298-8924 to order Race Ramps car ramps part number RR-30 or order online at etrailer.com. Free expert support on all Race Ramps products. 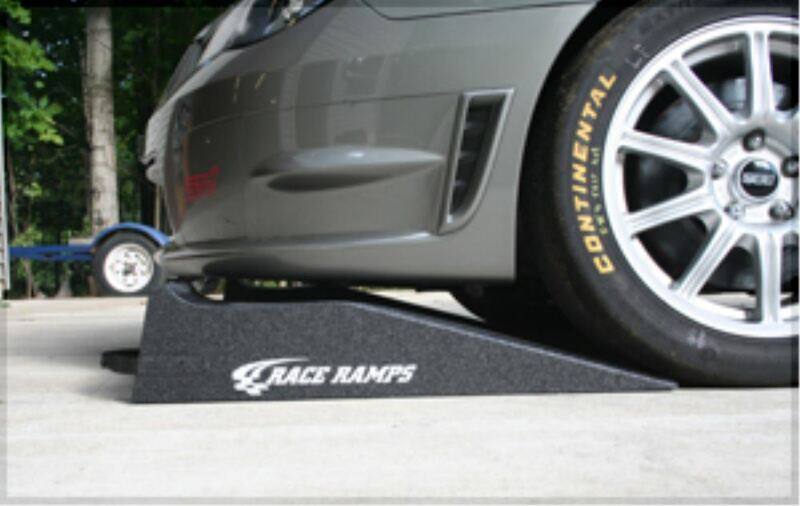 Guaranteed Lowest Price and Fastest Shipping for Race Ramps Rally Ramps for Service and Display - 5" Lift - 30" Long - Qty 2. Car Ramps reviews from real customers. 5" Tall x 30" long ramps let you lift your vehicle for service or display. Designed for small sports cars. Ramp incline creates a 16 degree angle of approach. Fit tires up to 8" wide. Lift It, Don't Scrape It! 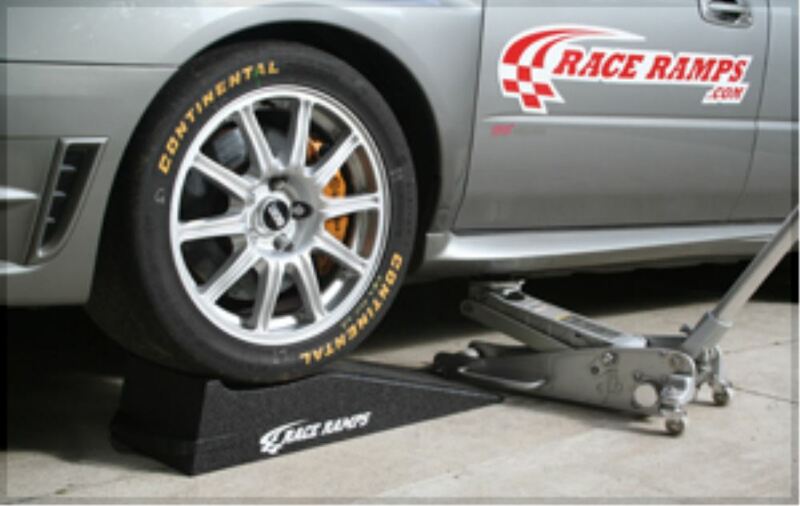 Race Ramps Rally Ramps can be used to lift your smaller sports car 5" off the ground for service or display. This allows you to perform routine maintenance such as changing your oil, drive belt, or transmission fluid. The ramps have a 16 degree angle of approach, which allows you to lift your vehicle without worrying about scraping its front end. It also eliminates the need for heavy jacks and cumbersome jackstands. 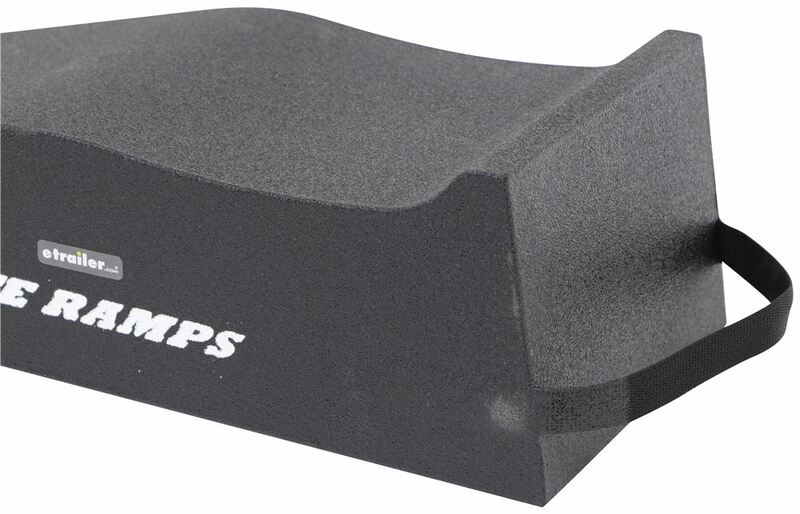 These ramps are made of ultra-strong, solid core, high-density EPS foam that won't crack or bounce. Each ramp supports 1,500 lbs - giving you a total weight capacity of 3,000 lbs for lifting a vehicle for service or display. The ramps are lightweight, weighing no more than 4 pounds per ramp, so you can transport and store them with ease. 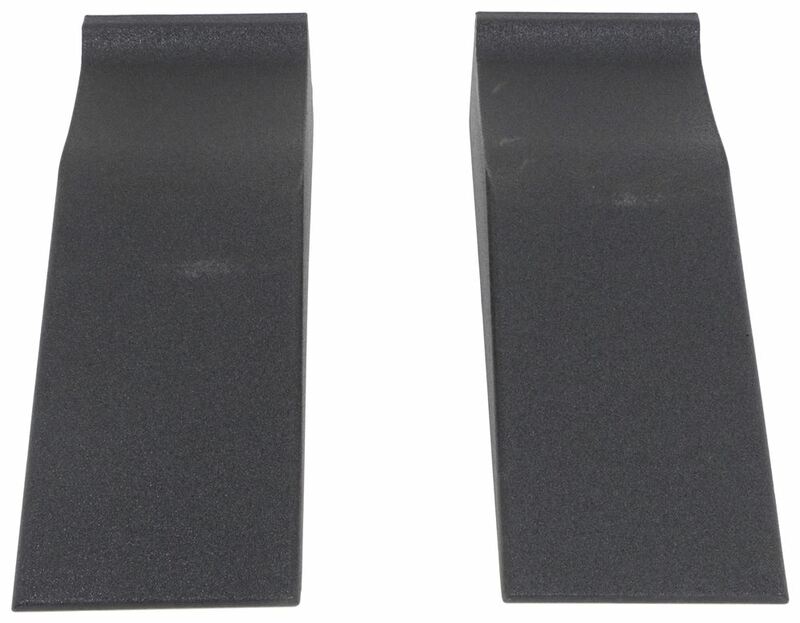 The ramps are covered with a textured coating and are flat on one side. This keeps them from skidding when you drive up on them. The coating is a hybrid polyurea compound that is resistant to water and other automotive chemicals commonly found around the garage. And although this coating is durable, it will not scratch, mark, or scrape your garage floor or the ground. A built-in handle on each ramp makes maneuvering them easier than heavier steel or aluminum ramps. The ramps can also hang vertically to free up storage space in your trailer or garage. 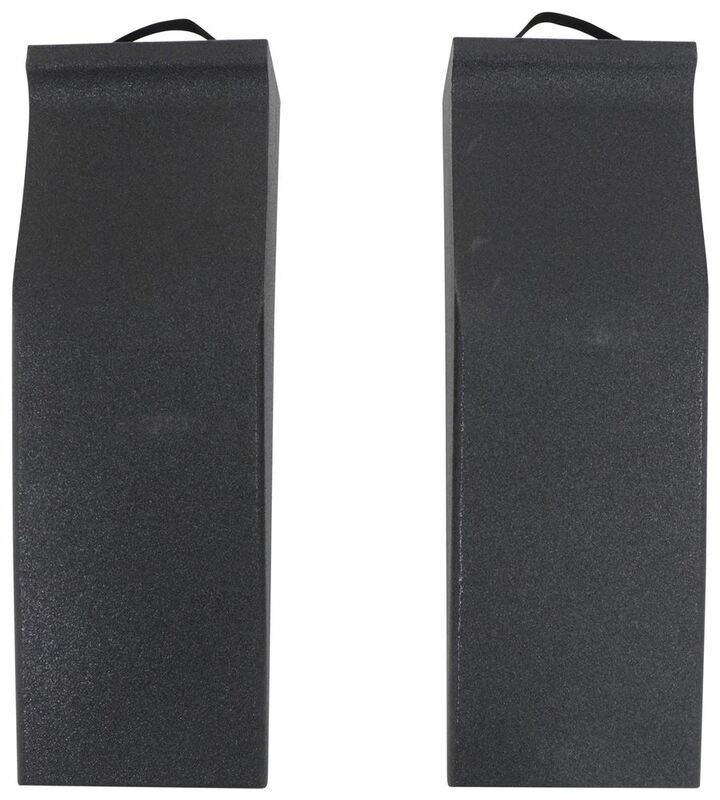 4" Tall x 27-1/2" long ramps attach to a platform or lift to load your vehicle for service. 3" notch supports existing platform or lift ramp. Ramp incline creates an 8.8 degree angle of approach. Fit tires up to 12" wide. 5" Tall x 48" long ramps attach to a platform or lift to load your vehicle for service. 3" hook-nose connects to forward side of platform or lift. Ramp incline creates a 6.4 degree angle of approach. Fit tires up to 18" wide. 14" Tall x 18-1/2' long portable ramp and platform system lets you lift your vehicle for service or display. Wheel cribs include removable cutouts to fit racing scales. Removable midsections and inclines. Fit tires up to 14" wide. Mighty Cord 90-Degree RV Power Cord Adapter - 30 Amp Twist Lock Female to 15 Amp Male - 12"
Do you have a question about this Car Ramp? The # RR-30 will give you an extra 5 inches of height, so they should work perfectly for you since you were looking to gain an extra 4-5 inches of height. The ramps are compatible with vehicles weighing up to 6000 lbs. The ramps are also lightweight and very easy to handle. To determine if the approach angle of your truck is compatible with the rams, use a yardstick and take a measurement as outlined in the diagram I've provided for you. 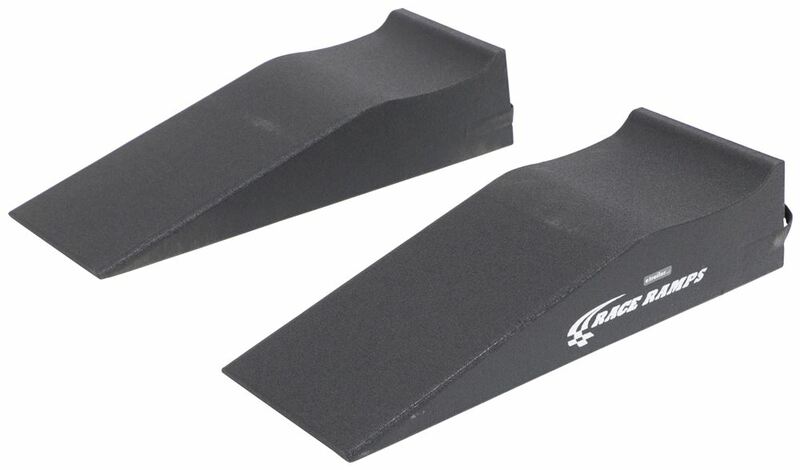 Can Race Ramps Rally Ramps Be Trimmed At Wheel Stop for Low Car Compatibility? I reached out to the manufacturer and the Race Ramps Rally Ramps - 30" Long - 5" Lift - Qty 2 # RR-30 cannot be modified. The outside coating really protects the integrity of the unit, so a modification could cause a significant difference in capacity. 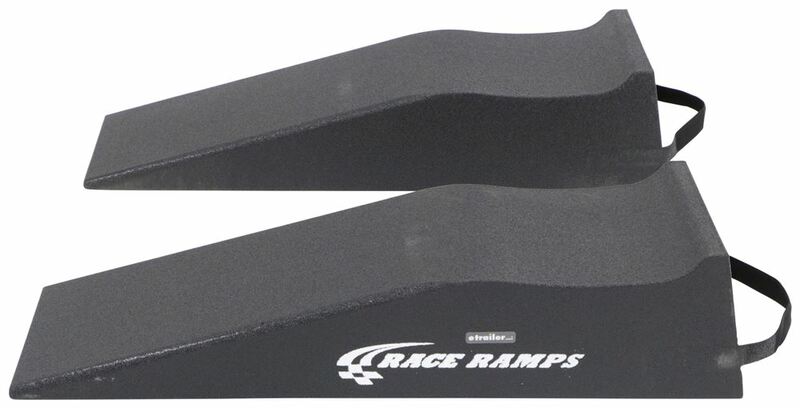 You would either want to use a jack to assist or want to use a different ramp like the Race Ramps Shop Ramps - Qty 2 # RR-SPR. Highest quality car ramps for the best price. Most detailed, accurate car ramp information available.